Ken was restless. His legs and feet moved under the table so much that the whole table shook. Other students complained about the noise and the shaking. Ken was an extreme case, but ABE/Adult literacy classes are full of students who cannot easily sit still, and whose restlessness interferes with the learning of others. In spite of all those activities, however, Ken still had to spend a fair amount of class time “sitting still,” which was certainly not an accurate description of his constant movement. So I got some advice from my friend Jenny Horsman. Jenny always sets out a variety of arts material on participants’ tables whenever she facilitates a group session of any kind. She invites people to use them however they like, although making art with these materials is not part of the session in any formal way. Her photos on this page show the kinds of creations people have made while taking part in discussions about unrelated topics. 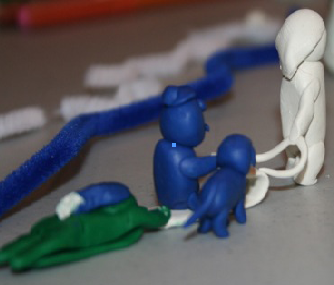 For more on this, click on the pile of modeling clay on the table at the centre of the picture on the learning and violence website. 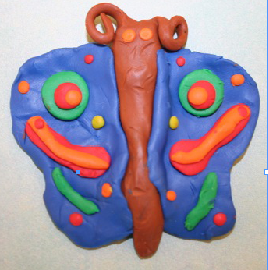 So, following her example, I went into class with a big tub of modeling clay, or plasticine as I used to call it. I explained that people in my life had been complaining about my annoying habit of jingling my keys and coins in my pocket when I talked (which was true) and several students confirmed that I also did it during class, although they were much too polite to classify it as annoying. I said I had brought the modelling clay to give my fingers something quieter to do, and that anyone else who wanted to try it was welcome to join me. I passed the tub around the tables. Everyone took a lump of modelling clay that first day, and I noticed that it did keep me from jingling my keys and coins, but I couldn’t stand the mess it left on my hands, so I gave it up after a couple of tries. Some of the students had the same reaction, and couldn’t wait to get out of the classroom to the washroom. But the effect on Ken was immediate. His fidgeting and table-shaking stopped immediately, and he didn’t seem to mind the mess at all. Over the weeks that followed, he made many delicate and elaborate sculptures: canoes with paddlers in them, complete with oars and faces; cars likewise detailed; and animals curiously like the real things. Ken focused his hands, his energy, and, usually, his eyes, on his creations.He did seem to be following the discussions in the class, occasionally making a comment and always responding appropriately to questions when I asked him directly. Did the modeling clay improve his ability to learn the work we covered in class? I don’t know. Did the clay make him more comfortable and so increase the number of hours he spent in class? I think so. DId modeling decrease the disturbance he made for other learners? I know it did. Complaints about him jiggling the table stopped completely. The whole room was calmer. I found it easier to concentrate on teaching. 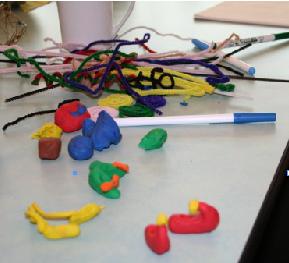 Some students continued to use the modelling clay some days, but not other days, or would play with it for a few minutes at the beginning of a class, but drop it as they got engaged in the lesson. Ken was the only one who modelled every day, and nearly every minute of every class. When Jenny first suggested I use modelling clay in this way, I thought my adult literacy students would perceive it as childish and would be unwilling to take it up, but I was wrong. Why was it acceptable? I offered the clay as a solution to my problem; I offered it to everyone, not to a few selected “troublemakers who couldn’t sit still”; it really worked to help some people calm their restlessness; for the first few days, nearly every student tried it out; and as time went by, it became clear that Ken was really good at modelling, so people started going to look at his production after class, to admire what he had done. That was very positive reinforcement for him to continue making sculptures. I often wished I’d spent more time on “art” projects with my students – I’m sure it would have helped even to suggest they hand in graphics or drawings with their essays or reports. As I was teaching high school completion English I felt uncertain and afraid – certainly I wouldn’t have chosen to hand in any graphics or drawings when I was writing but I wasn’t an “artistic” type. I realize now it would have legitimized those who felt they wanted to doodle during class time and would have made their essays more interesting to me to read! I notice your blogs lead me down side trails almost all the time! I know the feeling–worried about where “art” might take me. Wish I’d gone there more often. Great idea! I have a couple of exercise balls in my class for students to bounce on, but this gives them another way to move while they’re learning.